In addition to makeup tutorials and Outfit of the Day pictures, an essential part of any Pinterest or Instagram feed is the classic manicure photo. Sometimes, a nail tutorial is included, showing viewers exactly how to achieve the intricate look. But sometimes you may want something a little easier—that’s where these nine manicure ideas that anyone can do come in. Just pick your desired look, grab your favorite bottles of polish and get ready to load Instagram with your own cute nail pictures. Who says neutral has to be boring? Employ two classic neutral shades—black and beige—to create something a bit more eye-catching than one solid color. 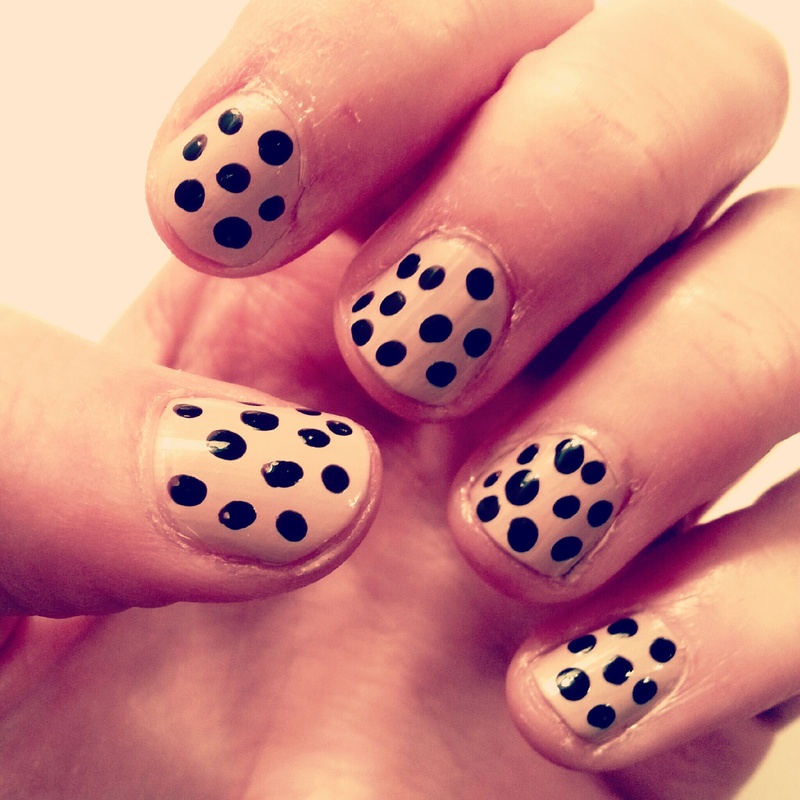 Reverse the colors (beige dots on black bases) to create a darker look. Just use those handy pointed Q-tips, or the end of a paperclip for even finer dots. 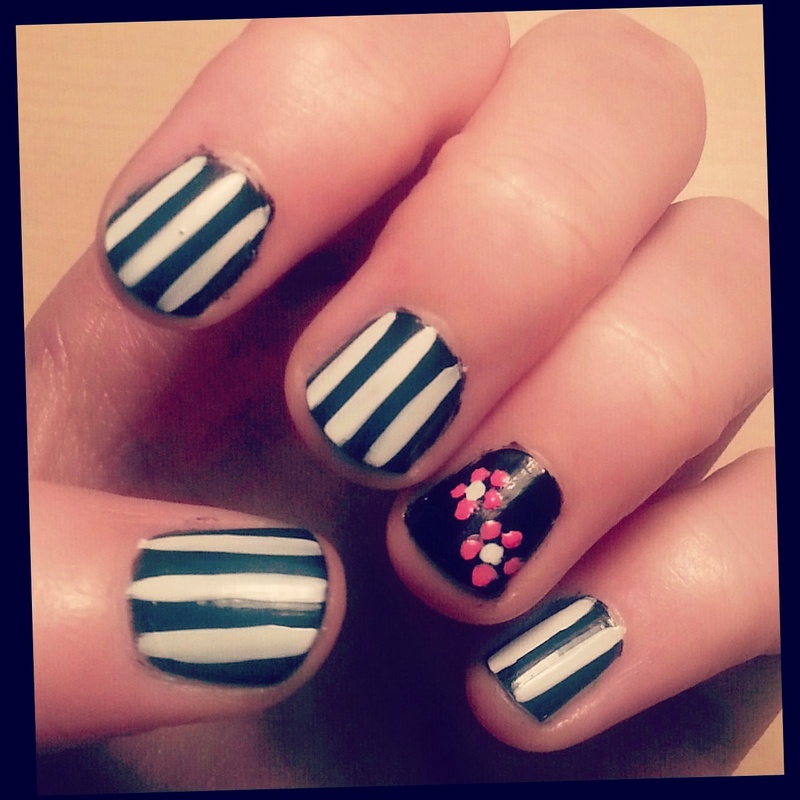 Nails don’t have to be extravagantly over-the-top in order to be glamorous. Sometimes all it takes is a two-tone design that puts a modern twist on the traditional French manicure. The key to this look is the opposite finishes—bright matte red-orange pops next to shimmery bronze. In order to get a perfectly pointed tip, put a piece of tape diagonally on your nail, basically creating a triangle stencil. Paint on the shimmery base color. Once fully dry, remove the tape, and carefully paint the remaining triangle with the bright polish. Red, black and white are great colors on their own, but putting them together as a trio takes glamour to its maximum level. 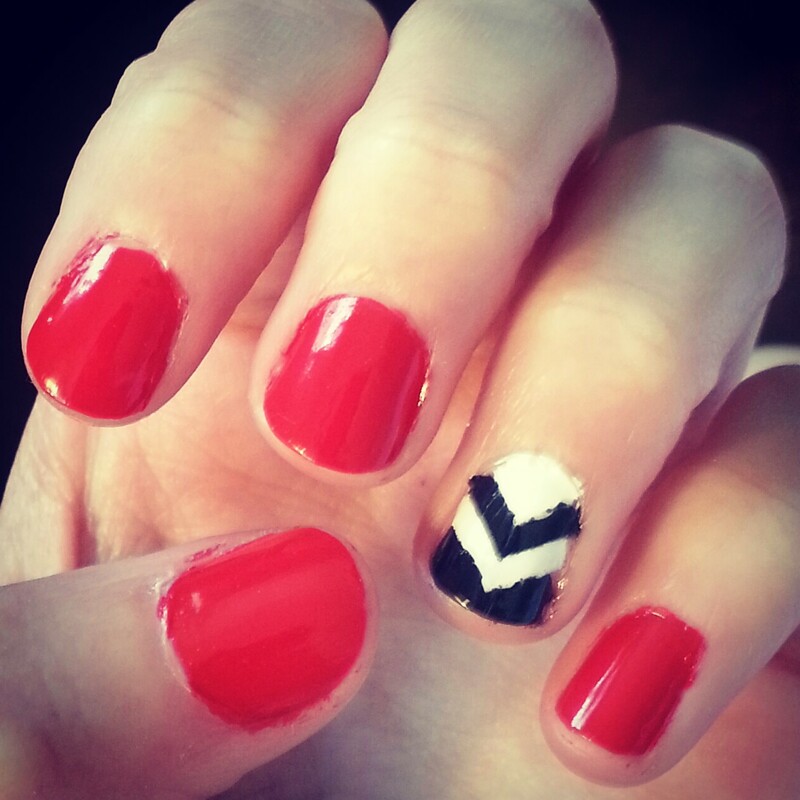 Amp up classic red nails with a black and white chevron accent nail. 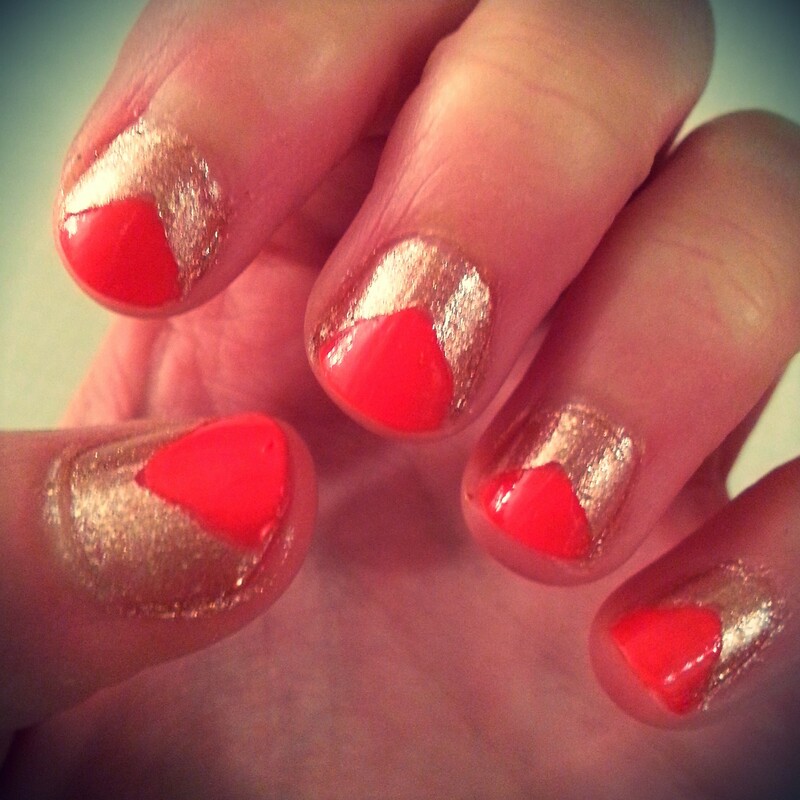 The accent nail may sound intimidating, but just use a striper polish to make the triangular stripes. Chevron is trendy at the moment, but any black and white print (stripes for something modern, polka dots for a more retro throwback) looks great as an accent nail for this look. Implement the classic femininity of pink and lavender when you’re feeling a little extra Barbie-like. Mismatched nails also amp up the playful factor. The trick? Have one solid design (in this case, pink), one graphic design (white and lavender stripes), and an accent (floral) to pull everything together in the most fabulous way possible. 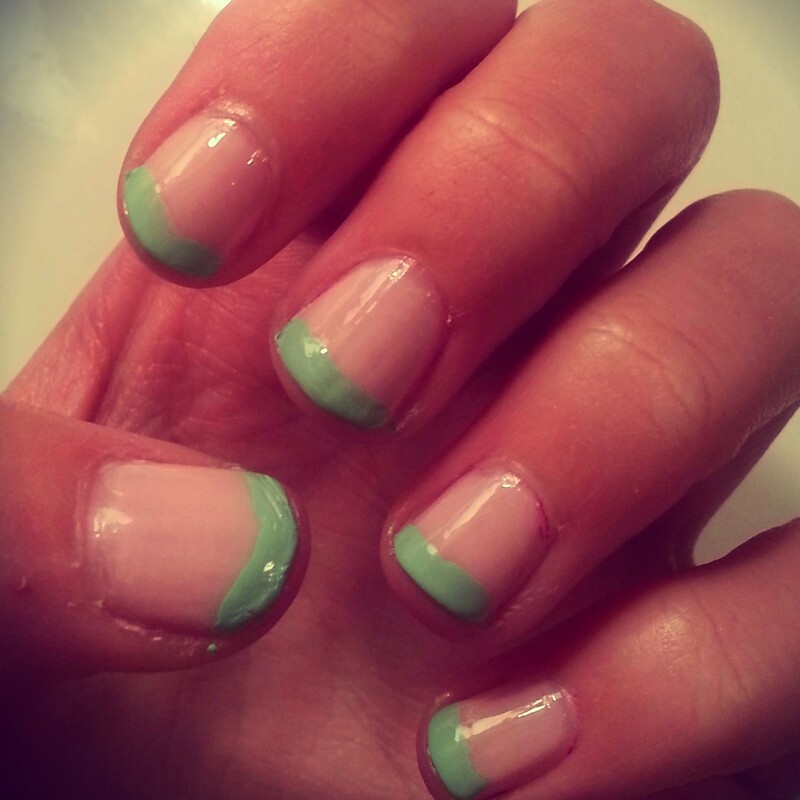 Get on the pastel bandwagon with a cotton candy-inspired manicure. The beauty is in the simplicity. 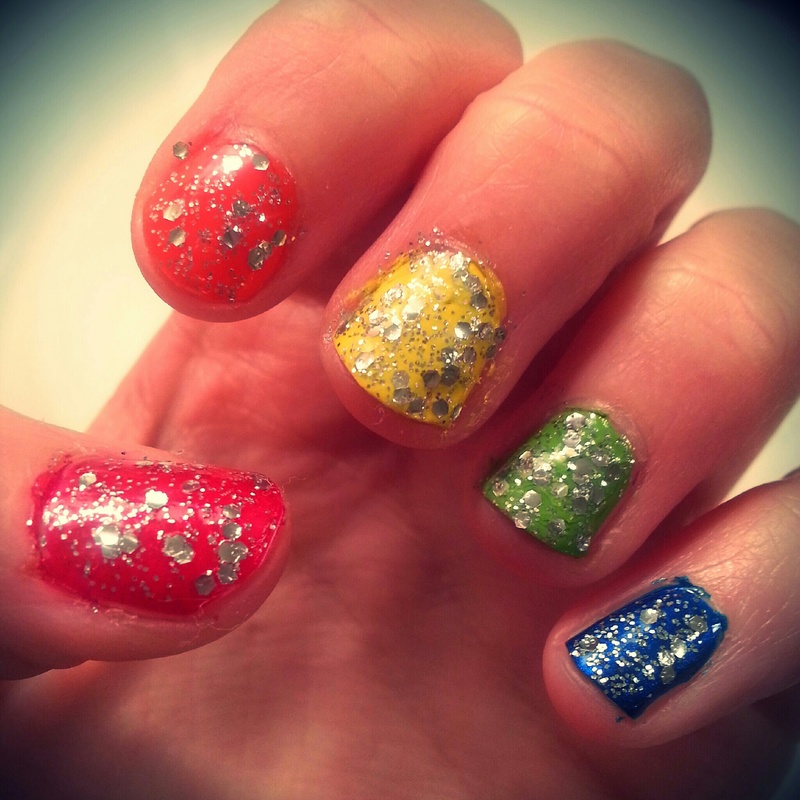 Paint nails all one girly color, then keep your hand steady and just paint on a tip in a complementary shade. Bubblegum pink and mint green are classic pastel hues, but baby blue, powdery lavender, or even pale yellow would also work. Throw it back to grade school with a manicure of classic Crayola hues. Draw colors from the rainbow spectrum (red-orange-yellow-green-blue-purple) for a simple order to follow. Anchor all the nails together with a layer of sparkling silver glitter. 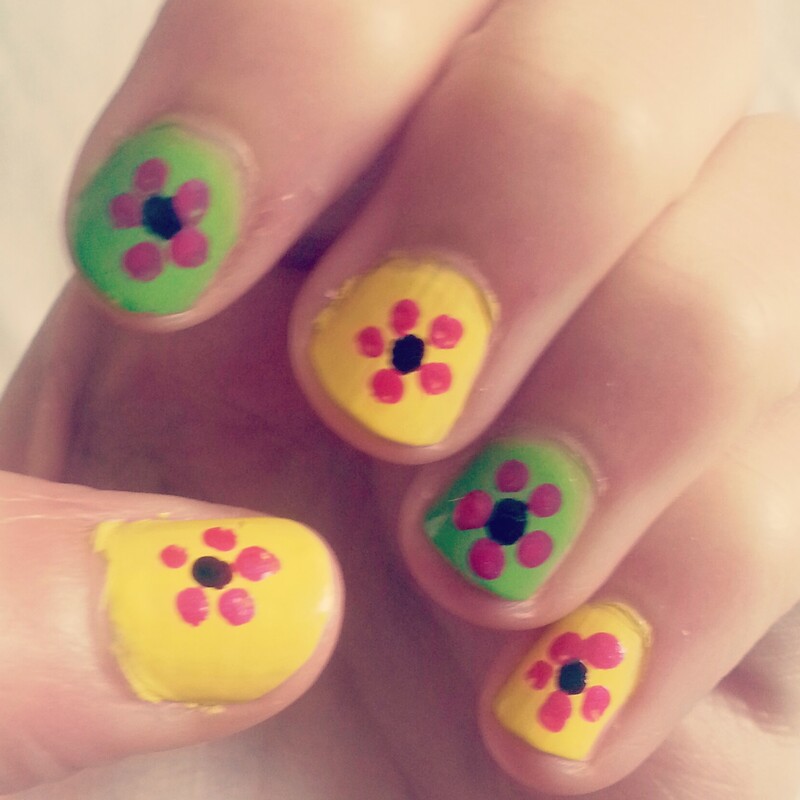 It’s hard to not feel happy when your nails are rocking colorful daisies. Pick two bright shades (like sunshine yellow and lime green) and paint them in alternating order. 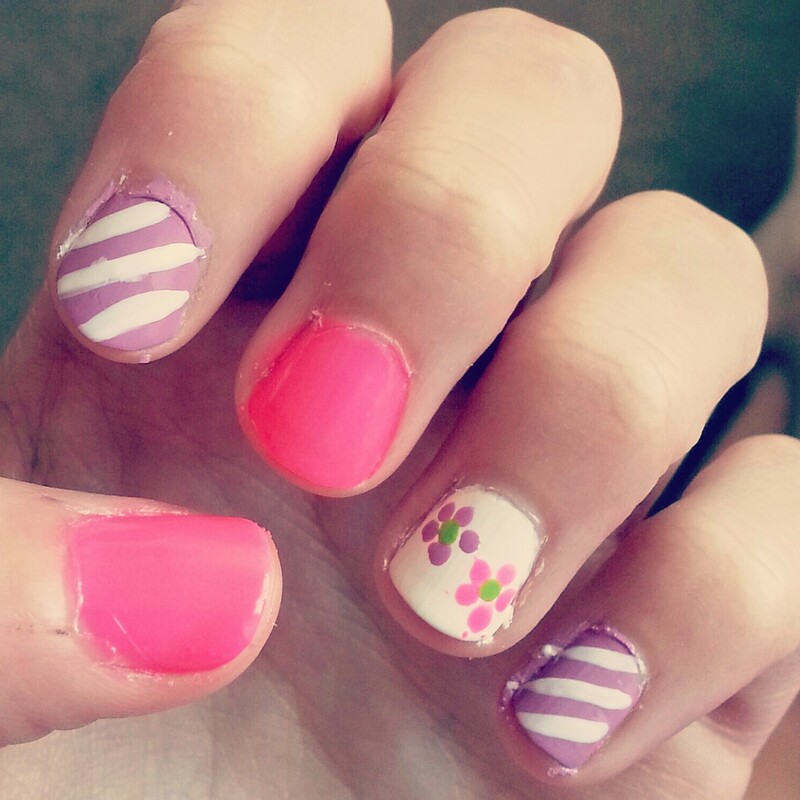 Use a pointed Q-tip to top each nail with a flower. The bright colors and dotted daisies put a little dose of summer on your nails, even if the weather outside is getting a bit cooler. 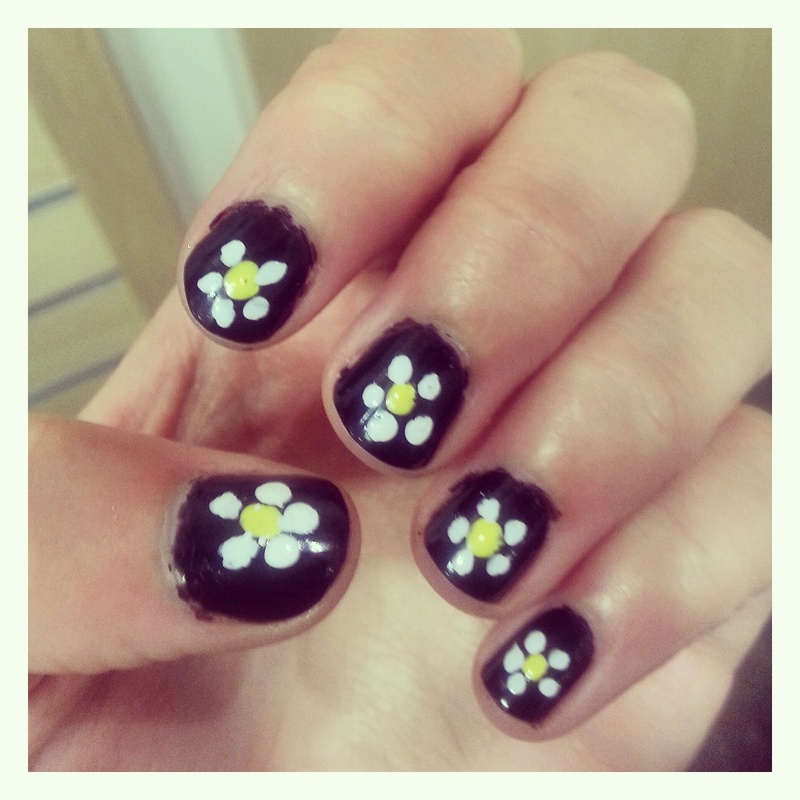 Put a more bohemian twist on the above look by putting white and yellow daisies on a black (or navy blue) background. The flowers are still fun, and the contrast of light on dark really pops. But the black base makes this version better suited for cozier autumn and winter outfits.